I just read a negative review of this so I'm happy to read a positive one but much as I'm curious about these unlikable characters, I'm also afraid that they might really succeed at being unlikable. Also, not sure if I like the sound of this love triangle. It sounds like there's more to it than just a simple love triangle though. I'm so glad to see such a praising review from you for this story Keertana. The early reviews hadn't been that great, but it's good to know that Hodge delivers a really promising read. Gorgeous review! Even though the story sounds like it's got some issues, the characters seem to really shine through. I like that Hodge doesn't change their essential beings or have them "tamed" by one another. ooh i am so curious about this one!! i am v intrigued by how you describe the characters. hmm!! YAY KEERTANA!!! I just finished this one a couple weeks ago and fell madly in love with it. I adored the characters and the fact that I never really liked them all that much, but I found them endlessly fascinating. 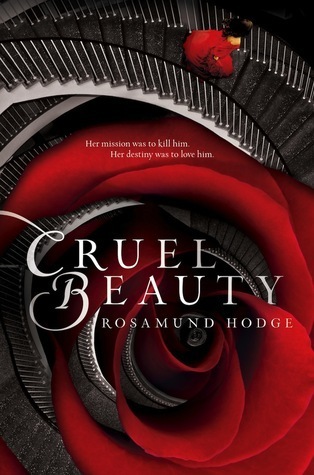 You're exactly right that Cruel Beauty is the perfect name for this book, definitely fitting in so many ways. I think this will be a love it or hate it book for a lot of people, but I was a huge fan and I'm so glad you were too! I just love how complex this sounds! And to think that I was unsure and VERY hesitant when I was deciding to request it! It's a good thing I did! While I avoid retellings and can't think of a single one I actually liked, I'm pretty sure I'm going to enjoy this. Okay, now I really want this book. I love B&B retellings so that was already a plus, but I really am curious about the characters! I love it when the twist is SO unusual. I also don't mind that it comes together in the end... as long as it does! So needing to get this book! Wow! That is some review! After reading it I've decided I really want to read this one. If you can have problems with this novel and still rate it so highly I am sure I will love it! Awesome review! Oh I'm so happy to read a positive review of this one from you, Keertana! And you know how I appreciate knowing how books work as a retelling, so I appreciated all of your thoughts devoted to that particular aspect of this book. I like unlikeable characters myself (as long as they remain true to form and their behaviors/actions can be explained, you know?) It sounds as though that's the case here. I am curious: does this pay homage to any particular Greek myth? I need to get back to this one soon! Some other more pressing books got in the way. I'm really glad that you ended up liking this one, and I'm very curious about these unlikable characters. But I'm a huge fan of Beauty and the Beast retellings and this one sounds a bit different so I'm excited. I'm still very hesitant about that love triangle, especially because you didn't' think it was resolved adequately. But I know you said it's worth it to read this. I'm hoping so much that this is a winner for me! I will for sure let you know when I read it.